Ted Robertson - Staff Biologist- Condor Country Consulting, Inc.
Mr. Thayer has more than fifteen years of professional experience in biological consulting, specializing in botanical and wildlife habitat surveys and wetland delineation. 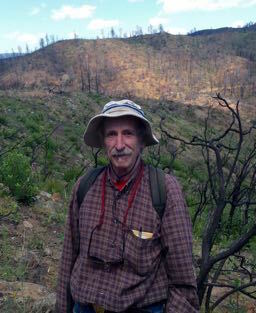 He has coordinated and participated in numerous biological assessments, terrestrial and aquatic vegetation and wildlife habitat assessments, multiple-season focused botanical surveys for special-status plants and natural communities, wetland delineations, and vegetation mapping. He has analyzed impacts to biological resources, developed mitigation strategies and restoration plans, overseen mitigation implementation, and monitored construction activities within or adjacent to sensitive habitats. Mr. Thayer has performed qualitative and quantitative vegetation assessments following California Native Plant Society protocol, as well as sampling vegetation to measure mitigation or restoration progress against success criteria. He has authored, edited, or contributed to hundreds of technical reports, letters, memoranda, biological sections of environmental impact reports, and other documents used in environmental compliance for both public and private projects. Mr. Thayer has a thorough knowledge of relevant local, state, and federal environmental legislation and policies. Mr. Thayer's experience in California includes conducting more than 90 wetland delineations verified by the U.S. Army Corps of Engineers. He has far-reaching knowledge of special-status plant species, including their identification, rarity, distribution, and soil and habitat preferences. Mr. Thayer also has field experience with special status wildlife species, including western burrowing owl, California red-legged frog, California tiger salamander, western pond turtle, silvery legless lizard, San Francisco dusky-footed wood rat, Alameda whipsnake, San Joaquin kit fox, Valley elderberry longhorn beetle, Callippe silverspot butterfly, and Coast Range shoulderband snail.